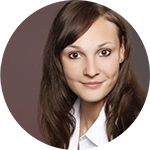 I am Franziska Slawinski and I am working as a Sales Manager at Spatineo since November 2015. I am responsible for sales of the DACH region (Germany, Austria, Switzerland). My work tasks include acquiring new customers, web presentations, attending to conferences and webinars and much more. Additionally I am in authority for German translation and different marketing related tasks. Working in a small company is great because everybody has his/her own responsibilities, can work independently and bring new ideas in. Sales is exciting because you have to be patient, persistent and creative and you never know what happens next. Besides it’s always great to have interesting conversations with experts and you get new knowledge while talking to them. In Finland I like using Google Maps or Here Maps by Nokia because they are easy to use and they supplementary show the fastest connections for public transportation. While traveling I use city maps, ask locals for some insider tips for a great restaurant or a place that fewest tourists know about or I just walk around without any kind of map and get to know the place on my own.